There are many features on our heavy duty Ratchet Buckle E-Strap that separate us from the competition. Our 18 inch lead end with extra long 16 foot overall length will fit around everything you typically move and never leave you short. Pull the strap through the looped end and make a Soft-Tie for holding motorcycle handlebars and more. The sewn on Hook & Loop Fastener neatly store away strap when not in use and also secure excess strap during use. Heavy duty 2 inch wide Polyester strap webbing easily achieves the 4,400 lb. Break Strength rating (1,467 lb. working load). Our Positive Locking zinc plated E-Fitting ends fit "Snaplocs" (E-Track Singles) and traditional E-Track. You should treat your toys and expensive cargo better! So replace your outdated, tangled, wimpy S-Hook straps with Snap-Loc Cargo Control Systems "E-Straps and Snaplocs" on your Pickup Trucks, Trailers, Truck Racks and more! Extra long 16' length with 18" lead end. Hook & Loop fastener for storage and securing excess strap during use. Heavy Duty 2" wide Polyester strap webbing with soft-tie loop end. These Rubber Tie-Downs are abrasion, crack and sunlight resistant for added durability. Perfect for quick tie-downs, these cords can stretch up to 1-1/2 inch times their original length. 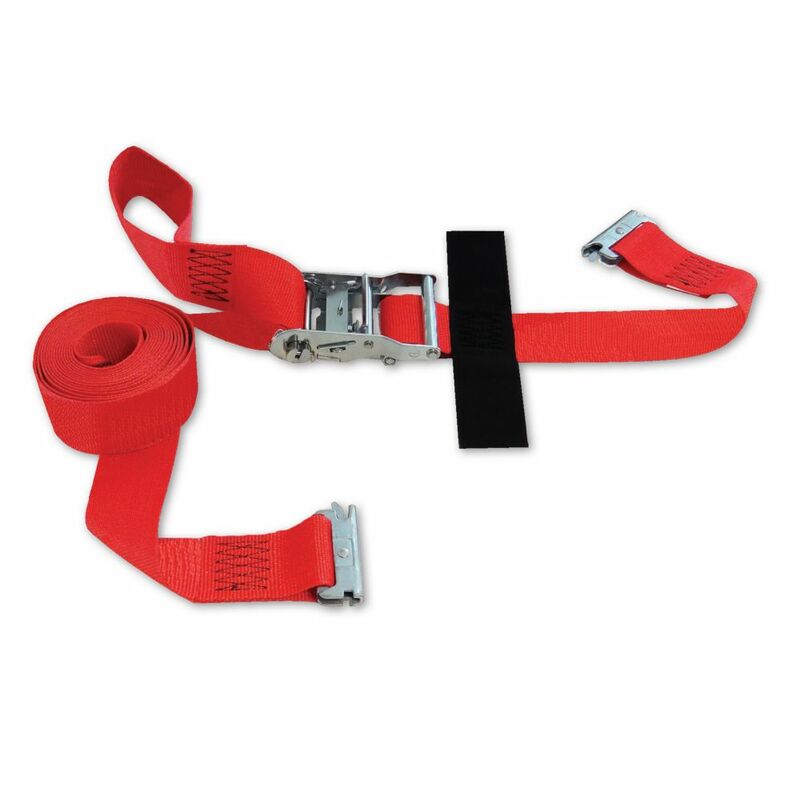 The KEEPER<sup></sup> 36" x 2" Premium Axle Strap is the ideal piece of equipment for a variety of heavy duty tie-down applications. Flat D-Rings especially designed for vehicle transport are compatible with trailer hardware for easy attachment and outstanding reliability. Perfect for use with ratchet tie-downs, this strap helps maximize tension and security, even under the toughest conditions. KEEPER<sup></sup>'s exclusive Hi-Test<sup></sup> webbing with a protective sleeve, resists abrasion and will never rot or mildew, ensuring long-lasting performance. With a 10,000 lbs. break strength and 3,333 lbs. working load limit, this KEEPER<sup></sup> product is engineered to meet or exceed dragster, antique, RV dolly, and a range other cargo transport needs. Snap-Loc E-Strap 2"x16' There are many features on our heavy duty Ratchet Buckle E-Strap that separate us from the competition. Our 18 inch lead end with extra long 16 foot overall length will fit around everything you typically move and never leave you short. Pull the strap through the looped end and make a Soft-Tie for holding motorcycle handlebars and more. The sewn on Hook & Loop Fastener neatly store away strap when not in use and also secure excess strap during use. Heavy duty 2 inch wide Polyester strap webbing easily achieves the 4,400 lb. Break Strength rating (1,467 lb. working load). Our Positive Locking zinc plated E-Fitting ends fit "Snaplocs" (E-Track Singles) and traditional E-Track. You should treat your toys and expensive cargo better! So replace your outdated, tangled, wimpy S-Hook straps with Snap-Loc Cargo Control Systems "E-Straps and Snaplocs" on your Pickup Trucks, Trailers, Truck Racks and more! Snap-Loc E-Strap 2"x16' is rated 5.0 out of 5 by 2. Rated 5 out of 5 by Carmen from Ratchet was easy to use. Exactly what we wanted based... Ratchet was easy to use. Exactly what we wanted based on the advertisement.